1. 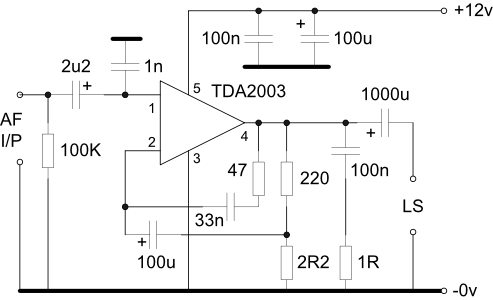 This audio amplifier will provide up to 3 watts output power into a 3 ohm load with a supply of 12V and uses a low cost, easily available integrated circuit. The IC should be cooled using a heat sink which may be mounted on the PCB and must have a clear air supply. Forced air cooling is not required. The 100n supply decoupling capacitor should be wired close to the IC pins to prevent HF oscillation. Component values shown will give a frequency response of -3dB at 112Hz and 12.2KHz. Additional AF filtering will be required for communications applications. Some RF decoupling has been provided but individual applications may require additional components depending on the final layout. 24mV input will result in 1W output into a 3 ohm load. 40mV input will result in 3W output into 3 ohm load and peak clipping will just be seen. Additional output may be achieved by increasing the supply voltage to a 14.4v - the IC is rated for a maximum supply of 18V although additional heat sinking may be required. The TDA2003 is pin and voltage compatible with the TDA2002. If in doubt, consult the device data sheet.